DARRYN Quigley from Solitary Islands Surf School gives us the low down on latest in the surfing world and what we should expect from the surf this week. It looks like the rain will continue this weekend on the Coffs Coast. A new south swell arrives on Saturday with the rain. The best spots to surf will be the protected southern corners out of the wind. On Sunday the weather will settle and the rain will back off, the swell will also back off a bit, but we should have waves at most of our beaches due to light winds. Moving into next week the medium sized swell from the south will hang around, with winds changing more to the north on Tuesday. Overall there will be plenty of options for waves right along the coast for the next week. Woolgoolga Boardriders will hold their last Open Comp for the year on Sunday. Keep an eye on the WBC Facebook page for location and times. The new date for the postponed last Junior comp will be announced early next week. 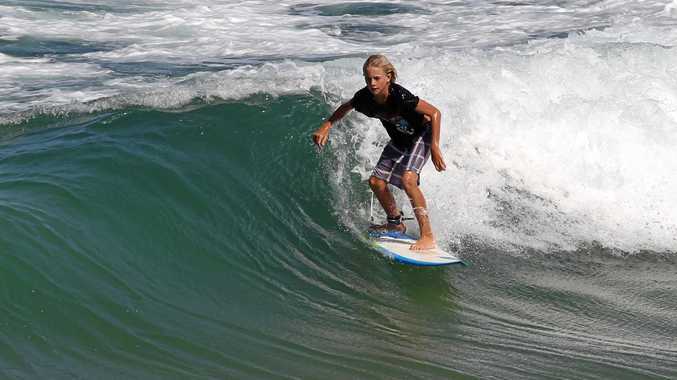 The Woolworths Grom comp will be on next weekend at Coffs Harbour. Woolgoolga Boardriders will be well represented competing against some of the best young surfers in Australia. It's been a big week in France for both the men and women's world tours. In the men's, Brazilian surfer Gabriel Medina's love for French beach breaks has continued, taking the men's title. Medina edged out Sebastian Zeitz in the final. The big news is current world champ John Florence has taken the ratings lead with two events remaining. In the women's it was Carissa Moore who took the title over Lake Peterson. The win breaks a long drought for the three times world champ. Sally Fitzgibbons holds the ratings lead just over current world champ Tyler Wright with the girls having just the one event remaining.